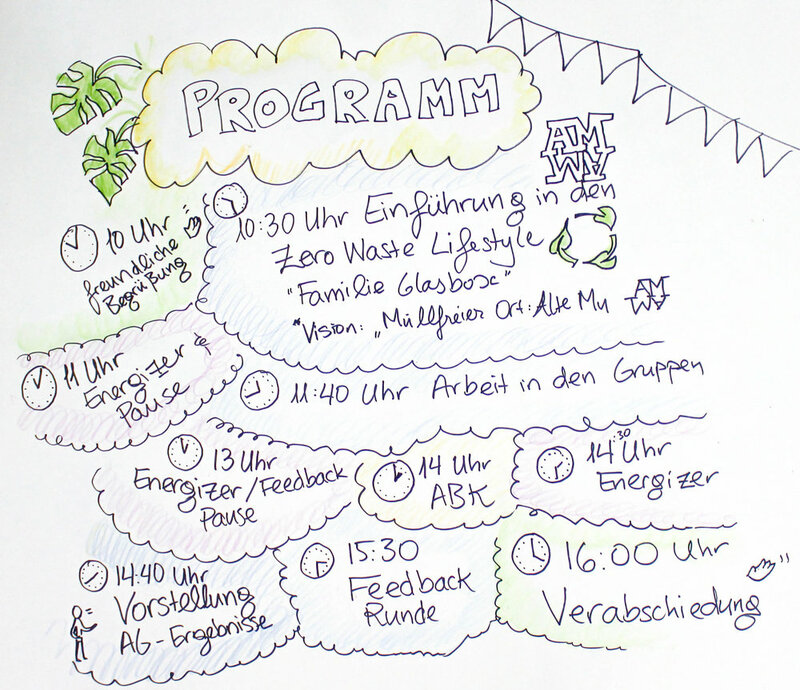 The program of events at the Alte Mu Visionstreffen, discussing how to move in a zero-waste direction. This included work in groups to brainstorm various aspects of approaching zero-waste in a social space. "An introduction to the Zero-Waste Lifestyle." The various panel speakers introduced themselves and each named one item that for them represents zero waste ("Zero Waste bedeutet..."): this included glass water bottles, glass jars for storing food, cotton bags for bread or shopping, using a wooden toothbrush instead of a plastic one, and reducing or eliminating flying as a mode of transport. 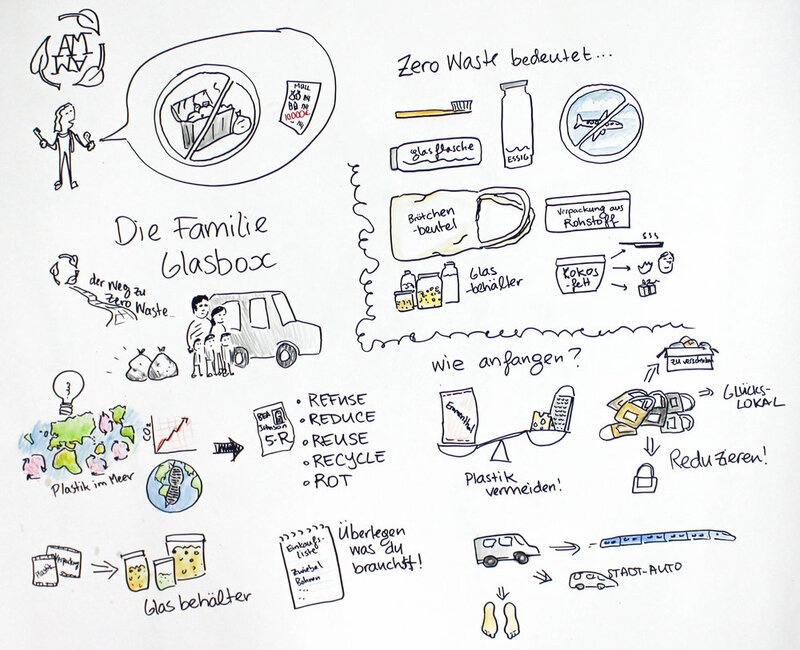 Then in the "Die Familie Glasbox" section, Marie, who runs Kiel's Unverpackt shop (bulk products, no packaging), spoke about how her family has made its shift to the zero-waste lifestyle. Conscious choices regarding consumption, travel, and attention to the 5 Rs: Refuse, Reduce, Reuse, Recycle, Rot (for more on this, check out Bea Johnson's site). An introduction to the Zero-Waste Lifestyle. I was only able to have the camera set-up for this first part of the event, as we were moving around too much after that to put the camera back out again. But voilà the time-lapses that resulted! Heimathafen Herz spoke about issues with trash at the Alte Mu in past; some of the surveys of trash found both on the ground and in trash bags have turned up a lot of things that could have been recycled. How to move forward, to become a trash-free space? Address patterns of consumption at the Alte Mu, see how circles can be closed. 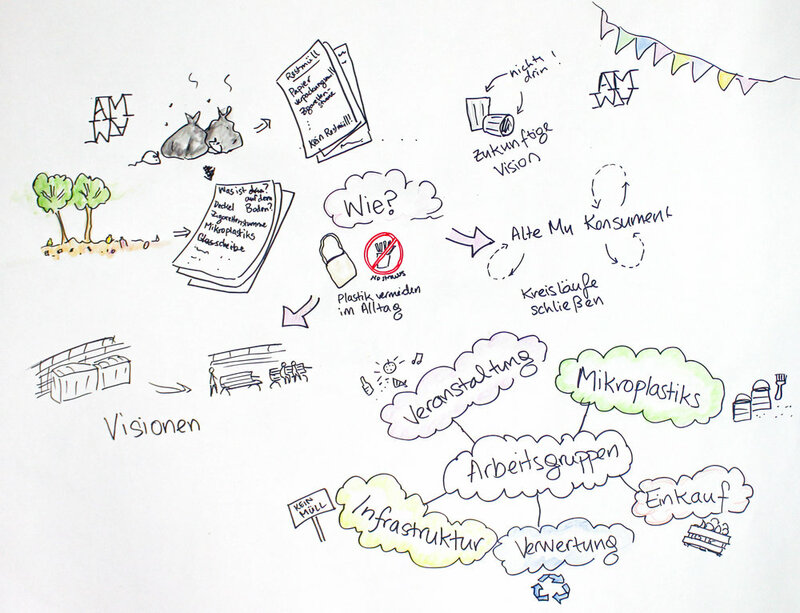 After this section we broke up into working groups addressing different aspects of how to go Zero-Waste: hosting zero-waste events (Veranstaltungen); consumption & buying things (Einkauf); Infrastructure; recycling and sorting the trash appropriately and effectively (Verwertung); and addressing Microplastics, especially in some of the products the Alte Mu relies on, like paints and construction materials. I got to run around and listen in on all the different groups! I caught them each at different stages of the discussion. There was some great brainstorming going on. Also I walked into an unrelated workshop, and sat in on it for about 3 minutes before realizing it wasn't part of the Visionstreffen. Walk around with a massive roll of paper, and everyone will think you know where you're going!